UTA has been promising to focus on buses rather than new rail projects. Now it’s proposing a $1B TRAX expansion. (Francisco Kjolseth | Tribune file photo) UTA is considering extending TRAX service to Lehi, mostly to help development of the soon-to-be vacated state prison site at the Point of the Mountain. This file photo from 2018 shows the TRAX blue line in Salt Lake City. But this past week, UTA officials told an advisory board that the agency is eying extending TRAX light-rail service all the way to Lehi, mostly to help spur development at the soon-to-be-vacated state prison site at Point of the Mountain. (Steve Griffin | The Salt Lake Tribune) The Utah State Prison in Draper Thursday January 4, 2018. Early estimates say that project could cost up to $1.2 billion. Maybe more. Timelines have penciled in finishing it as early as the end of 2023, or as late as the end of 2026, depending on the alternative chosen. A TRAX extension to Lehi has been in long-range plans for years, but in limbo without a firm timeline or funding. That is changing because of requests from the Point of the Mountain Development Commission, said Mary DeLorretto, UTA director of capital projects. She noted the commission was established by the Legislature “with the goal to maximize development opportunity on the state-owned land on the prison property.” It has been looking at many scenarios to do that, and they all need more roads or better transit. So she said they aim to soon begin an $800,000 study about running a TRAX line through the 700-acre prison site and on to Lehi, as the envisioning process by the Point of the Mountain Commission proposes. The end of the TRAX blue line now is in Draper. She said transportation agencies have pledged money toward the study to look at various alternatives, and to develop better cost estimates. They also plan to approach others for financial help, including businesses around Silicon Slopes in Lehi. She recently showed the UTA advisory board — appointed by cities and counties in the transit agency’s service area — the two main alternatives being considered. An east alignment would extend the blue line from the current end-of-the-line Draper Town Center station to wind around foothills to the Silicon Slopes area in Lehi — but would include a spur through the prison site. That alignment is what has been in long-range plans for years, except for the newly proposed spur through the prison area. A second alignment would take TRAX west from the Sandy Civic Center station (near Rio Tinto Stadium) to the FrontRunner commuter train alignment in South Jordan. TRAX would follow the FrontRunner line until it comes near the prison site, would traverse it and then continue to Lehi. DeLoretto said early estimates show the east alignment would cost less — about $739 million — but would likely also attract fewer riders, about 33,000 a day, as much of its route travels along unpopulated foothill areas. The west alignment is projected to cost $1.2 billion, but attract 44,700 riders a day. After that, officials would need to conduct an environmental study and develop a funding plan — including a decision on whether to seek federal funding for it. If only local funding is used (requiring less intensive environmental studies), timelines predict the east alignment could be finished in 2023 or the west alternative completed in 2024. If federal funding is sought, the east route may be finished in 2025 or the west in 2026. 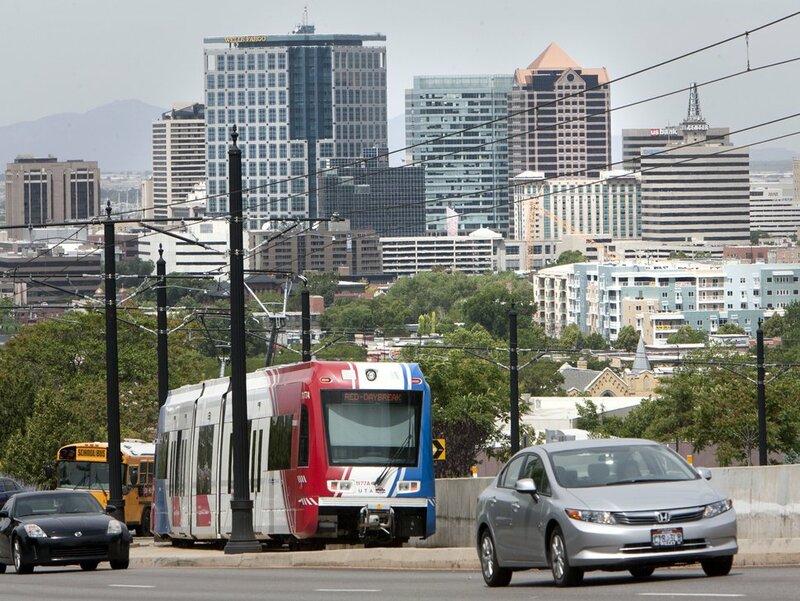 Steve Griffin | The Salt Lake Tribune A UTA TRAX train climbs out of downtown Salt Lake City as it heads to the University of Utah in Salt Lake City, Utah Monday June 24, 2013. The Salt Lake Chamber and its Utah Transportation Coalition has released a study on the impact of investing in UtahÕs transportation system. 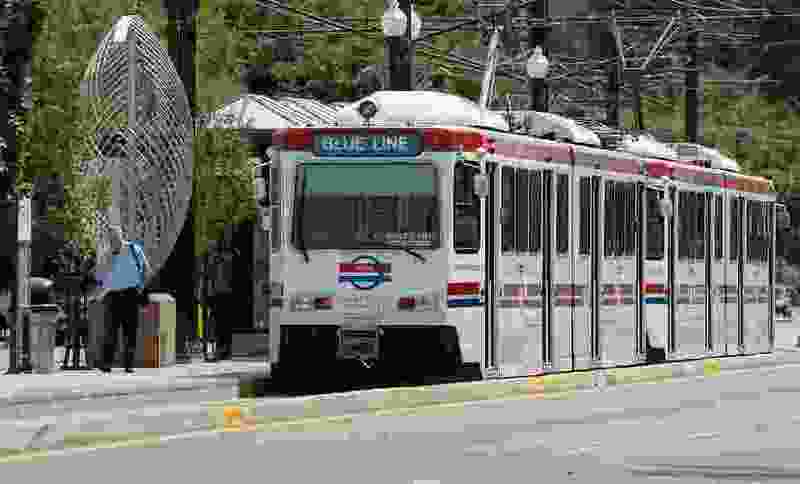 However, George Chapman — a former Salt Lake City mayoral candidate who closely watches UTA — told members, “I am against any projects at Point of the Mountain until we restore a robust bus system” as promised by the agency. The proposal emerges after years of UTA saying that it considered its large rail projects as completed, and was shifting focus to improve bus service — after public complaints that it had been ignored. Bus operations are the agency’s second biggest expense, after debt service. The agency also said it was looking more at cheaper alternatives than light rail, including bus rapid transit lines. UTA used its promises to focus on bus service in promoting passage of a sales tax increase for transit through Proposition 1 in 2015. The measure passed in Weber, Davis and Tooele counties, but was rejected in Salt Lake, Utah and Box Elder counties amid complaints about high UTA executive salaries and extensive travel. The Legislature last year restructured UTA, including creating a new full-time, three-member commission designed to keep tighter oversight on its administration. At the same time, the Legislature allowed counties to impose the old Prop 1 tax without voter approval — which Salt Lake and Utah counties then did. Correction: Tooele County voters passed Proposition 1 in 2015. An earlier version indicated otherwise.